Microsoft laptops and tablets are just as trustworthy and familiar as the operating system itself. The launch of Windows 10, along with Microsoft's attempt to mimic the success of AI assistants, has helped to make the infamous brand a contender in the computer arena. Supplement your desktop computer system, or get rid of it altogether in favor of something lighter, faster, and easier to use. Laptops are quickly and quietly replacing desktops simply because they're convenient and efficient. Don't you need a little more efficiency in your life? 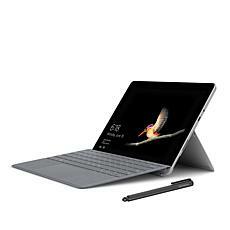 Try the Microsoft Surface to experience the fusion of a laptop and a tablet. From the widescreen to the removable keyboard, it will change the way you work and play. You get more than enough memory from such a small package, and the Surface tablet is even available with 128GB. The Surface is also available as a more standard laptop. You can get up to 8GB of RAM and 256GB of space, which means that it can effortlessly double as a quality gaming laptop. Don't mess around with a slow, bulky, outdated machine that no longer serves your needs. Browse the Microsoft computers at HSN. Inquire about our payment options to ensure that you walk away with a new laptop.